Nerf Modulus Regulator Just $33.74! Down From $60! PLUS FREE Shipping! You are here: Home / Great Deals / Amazon Deals / Nerf Modulus Regulator Just $33.74! Down From $60! PLUS FREE Shipping! Here’s another awesome deal you can get at Amazon! Score the Nerf Modulus Regulator for only $33.74 down from $59.99 PLUS FREE shipping! 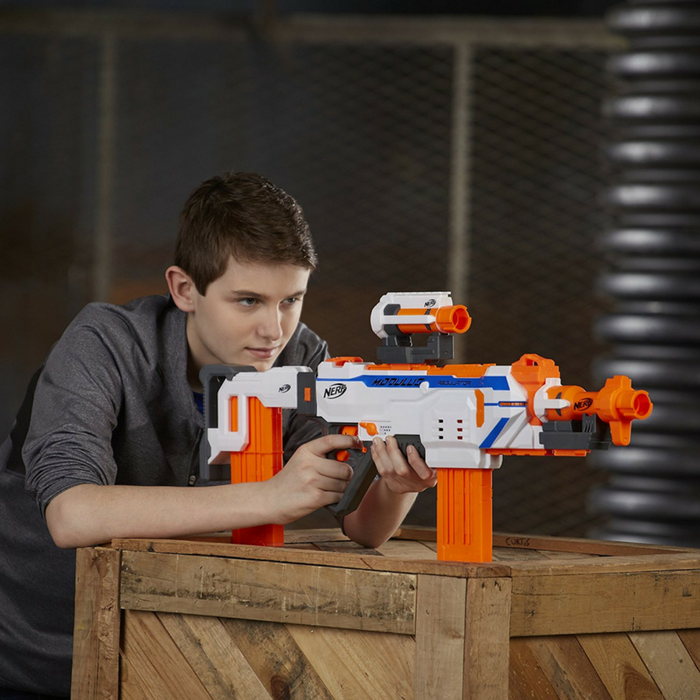 Kids can build their blaster for any mission or battle with the fully motorized Nerf Regulator blaster! With SwitchFire Technology, choose 1 of 3 firing modes; flip the switch to choose single-fire to fire 1 dart per trigger pull; select burst-fire to blast several darts per trigger pull; and switch to continuous-fire to continuously fire the darts. Load darts into both 12-dart clips, insert 1 into the blaster and store the other 1 in the storage stock. Power up the motor by holding down the acceleration button, and then let the darts fly! The indicator light blinks to let battlers know the clip is empty. Customize the blaster with the swivel handle to stabilize shots and the 2 barrel-scopes that can be used as barrel extensions or targeting scopes. With the full Nerf Modulus system, create over 1000 different combinations!